In eight groups of animals, including humans and songbirds, young animals learn to vocalize by listening to adults. Experimental evidence from laboratory studies supports this hypothesis for vocal learning, however there is no experimental evidence of vocal learning in wild animals. Dr. Mennill developed an innovative playback technology to simulate vocal tutors in the wild. Together with a team of collaborators, he conducted a five-year experimental study of song learning with free-living migratory Savannah Sparrows living on an island in the Bay of Fundy. He showed that wild songbirds learn to sing by listening to the songs of adult conspecific animals. Further, he showed that the timing with which the tutors are encountered influences vocal learning. This experiment provides the first experimental demonstration that wild birds learn to sing, and reveals that young songbirds learn to sing from nearby animals during critical stages of development early in life. 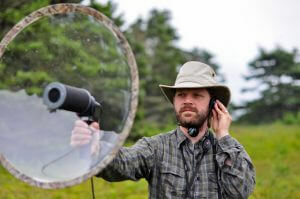 Dr. Daniel Mennill studies acoustic communication in temperate and tropical birds. He runs the Mennill Sound Analysis Laboratory at University of Windsor, where he and his research team use a field-based approach to study animals in the wilds of Canada and Costa Rica. Dan has helped to pioneer new technologies for bio-acoustic field studies of birds, including multi-channel array recording, interactive playback, and multi-speaker playback. Dan has published more than 130 papers in scientific journals, and supervised 36 graduate students. He is a Fellow of the American Ornithological Society, a councillor of the Society for Canadian Ornithologists, an Editor at the journal Condor: Ornithological Applications, and the Associate Dean of Science at University of Windsor. He lives with his wife, ornithologist Stéphanie Doucet, and their two young children in Lasalle, Ontario. Dan’s website: www.uwindsor.ca.